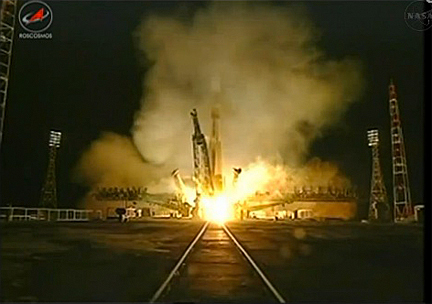 An unmanned Russian Progress supply ship loaded with 2.9 tons of supplies and equipment blasted off from the Baikonur Cosmodrome in Kazakhstan Wednesday, bound for the International Space Station. Perched atop a Soyuz booster, the Progress M-14M/46P spacecraft lifted off at 6:06:40 p.m. EST (GMT-5; 5:06:40 a.m. Thursday local time), climbing smoothly away from its launching pad for an eight-minute 45-second climb to orbit. There were no problems with the ascent and moments after separating from the Soyuz upper stage, the cargo ship's solar arrays and antennas unfolded as planned. This was the first of five Progress flights planned for 2012 and the second successful launch in a row following a third stage failure last August that destroyed the M-12M spacecraft and disrupted the space station traffic schedule. If all goes well, the M-14M cargo craft, carrying 2,050 pounds of propellant, 110 pounds of oxygen and air, 926 pounds of water and 2,778 pounds of supplies, spare parts and science gear, will carry out an automated approach and docking at the space station's Pirs airlock module around 5:08 p.m. Friday. Monitoring the approach and standing by in the Zvezda command module to take over by remote control if necessary will be cosmonauts Anton Shkaplerov and Oleg Kononenko. Their crewmates are Expedition 30 commander Daniel Burbank, Donald Pettit, cosmonaut Anatoly Ivanishin and European Space Agency astronaut Andre Kuipers. Next up for the space station is launch of a European cargo craft from Kourou, French Guiana, on March 9. Shkaplerov, Ivanishin and Burbank are scheduled to wrap up a four-month stay in space with a return to Earth on March 16. The European cargo ship is expected to dock on March 19 and three fresh crew members -- Gennady Padalka, Sergei Revin and Joseph Acaba -- are scheduled for launch March 29 with docking on tap two days later to boost the station's crew back to six.